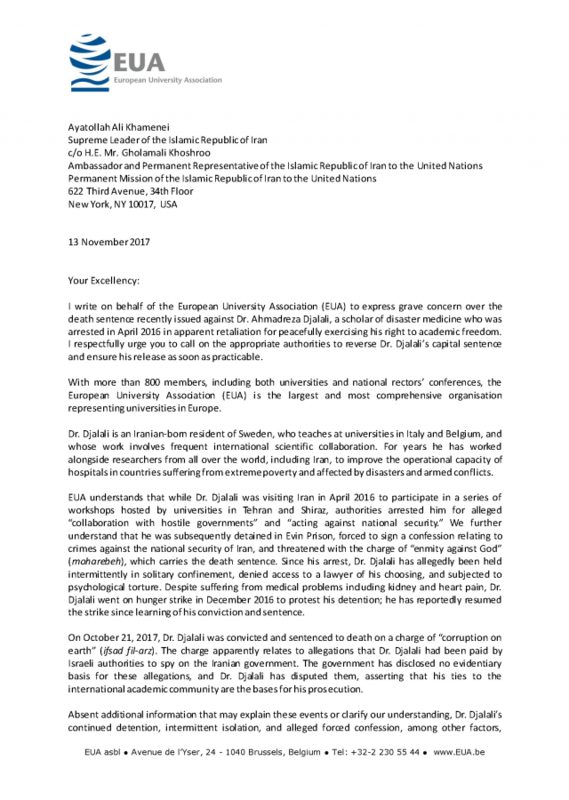 Brussels, Belgium — In a letter dated November 13, 2017, the European University Association (EUA) has called on Iranian authorities to reverse the death sentence against Dr. Ahmadreza Djalali and to ensure his timely release. Dr. Djalali, an Iranian-born resident of Sweden and teacher of disaster medicine at universities in Italy and Belgium, was convicted of “corruption on earth” and sentenced to death on October 21, 2017. Dr. Djalali was arrested in April 2016 while visiting Iran for a series of academic workshops and has been detained in Iran’s notorious Evin Prison ever since. Disputing all charges against him, including allegations that he had been paid to spy on the Iranian government by Israeli authorities, Dr. Djalali asserts that his ties to the international academic community are the bases for his prosecution. With 850 members across 47 countries, EUA is the largest and most comprehensive organization representing universities in Europe. EUA is headquartered in Brussels, Belgium.